Pair late 19th-early 20th century brass andirons. Late 19th-Early 20th century black Continental andirons with flame finials and twist shafts. 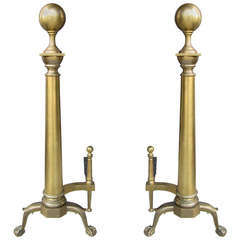 Late 19th-Early 20th Century Pair of Superior Brass Andirons with Face. 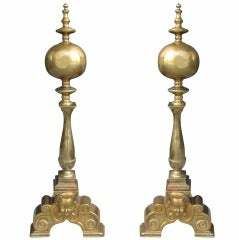 Pair of early 20th century brass andirons ball finial. A fine quality pair of late 19th-early 20th century Chinese iron foo dog dragons. Each dragon dressed in a helmet and full armour, breathing fire. Having spiral twisted open basket finials with a centered turned brass element, with splayed shaped feet. Enormous late 19th century English vintage fireplace andiron.